ALL BABIES ARE MADE TO ORDER AND TAKE ABOUT 2 WEEKS TO COMPLETE. PLEASE ASK QUESTIONS BEFORE PAYING BECAUSE I ORDER THE DOLL KIT YOU WANT THE SAME DAY YOU PAY ME. I START PAINTING THE ORDER THE SAME DAY I GET IT. ALL babies that are pictured are MY ACTUAL WORK. 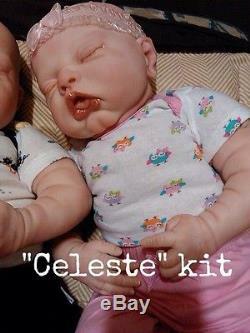 Your baby is made to order. You will receive a baby that is anywhere between 18-22 inches long, depending on the kit that is chosen. 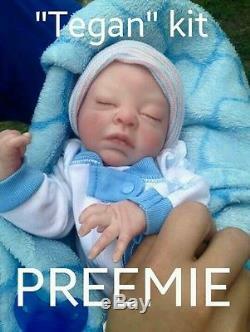 ALL BABIES ARE CAUCASIAN BY DEFAULT. 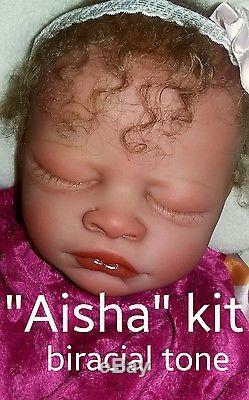 MESSAGE ME IF YOU WANT A BIRACIAL BABY. 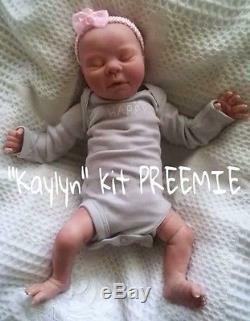 Each kit is different in weight and length but they are all "newborn" sized UNLESS THE KIT YOU CHOOSE IS PREEMIE. I WILL LET YOU KNOW WHEN YOU CHOOSE WHAT KIT YOU WANT. 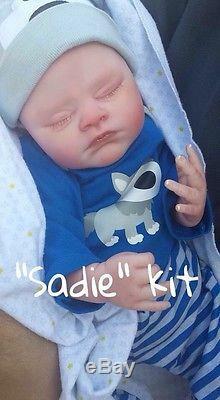 TO CHOOSE YOUR BABY I have added the names of the kits to the pictures on this listing. See which baby you like the best and message me which one you would like. Yanking at the head or limbs could cause them to come off of the body, but they can be easily reattached. All babies will be BALD, but they will have rooted eyelashes that look ever so real. You get to choose if you want a little boy or girl and you get to choose the accessories of your baby! If you want a hat or headband, or if you want a baby bottle with faux milk OR a magnetic paci for your baby. All babies come home with a diaper and outfit, a new blanket (blue or pink), magnetic paci OR bottle, and a hat or headband. All babies are made from high quality products! 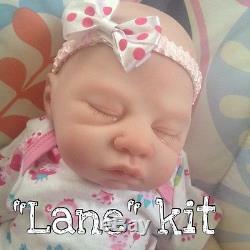 I use super soft vinyl doll kits and use cloth bodies on my babies. These are NOT silicone babies. The babies will range anywhere from 4-5 pounds in weight and will feel real. All babies will be painted with many layers of genesis heat paints that won't fade and are permanent. They will be perfectly blushed to look real and will have delicate veining and soft mottling to the skin tone! They will all come home with rooted eyelashes but at this time I will only be making bald babies. 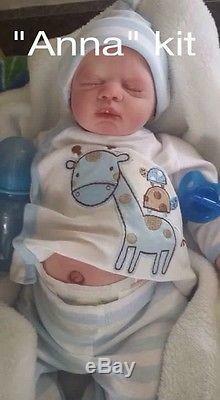 Your baby will still have eyelashes, but your baby will not come home with hair. Babies that have hair take alot longer to make and the hair is very expensive. All of my photos were taken in natural lighting. 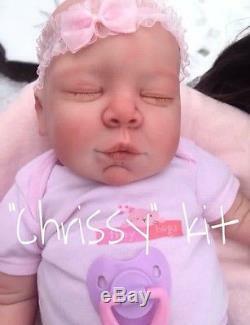 These picture do not do my dolls justice at all; They all look truly real and have been mistaken for real babies. All babies lips, mouth, eyes, and inside of the nose are glossed to look wet and the nails will be tipped white and also glossed to look shiny. And And I cannot cancel an order once I order your baby's kit from Bountiful Baby. If you would like pictures of your baby while I'm on the painting process, I can do that as well. Please let me know if you have any questions! I have many references from my website and Facebook page. Check out and "like" my Facebook page to see more of my work. Search: Last a Lifetime Nursery. 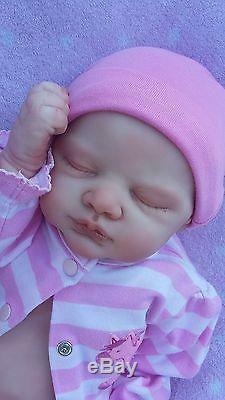 The item "CUSTOM Reborn Baby Doll Closed Eyes (Made to Order)" is in sale since Tuesday, December 22, 2015. 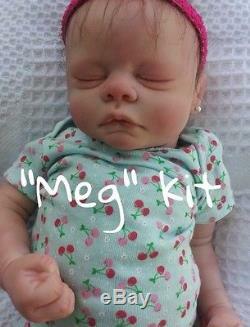 This item is in the category "Dolls & Bears\Dolls\Reborn\Reborn Dolls".rubink" and is located in Mary Esther, Florida. This item can be shipped to United States, Canada, United Kingdom, Denmark, Romania, Slovakia, Bulgaria, Czech republic, Finland, Hungary, Latvia, Lithuania, Malta, Estonia, Australia, Greece, Portugal, Cyprus, Slovenia, Japan, China, Sweden, South Korea, Indonesia, Taiwan, South africa, Thailand, Belgium, France, Hong Kong, Ireland, Netherlands, Poland, Spain, Italy, Germany, Austria, Russian federation, Israel, Mexico, New Zealand, Philippines, Singapore, Switzerland, Norway, Saudi arabia, Ukraine, United arab emirates, Qatar, Kuwait, Bahrain, Croatia, Malaysia, Brazil, Chile, Colombia, Costa rica, Dominican republic, Panama, Trinidad and tobago, Guatemala, El salvador, Honduras, Jamaica, Antigua and barbuda, Aruba, Belize, Dominica, Grenada, Saint kitts and nevis, Saint lucia, Montserrat, Turks and caicos islands, Barbados, Bangladesh, Bermuda, Brunei darussalam, Bolivia, Ecuador, Egypt, French guiana, Guernsey, Gibraltar, Guadeloupe, Iceland, Jersey, Jordan, Cambodia, Cayman islands, Liechtenstein, Sri lanka, Luxembourg, Monaco, Macao, Martinique, Maldives, Nicaragua, Oman, Peru, Pakistan, Paraguay, Reunion.